Treat yourself to something special this Christmas. Celebrate the festive season with a living tree - compact and beautifully formed. Eco-friendly, just plant your tree outside when you're ready. Presented in a red velvet sack and covered in artificial snow. Supplied as a young tree, fully decorated, approx 50cm tall. What better way to celebrate the festive season than with your very own living Christmas Tree covered in its own decorations! 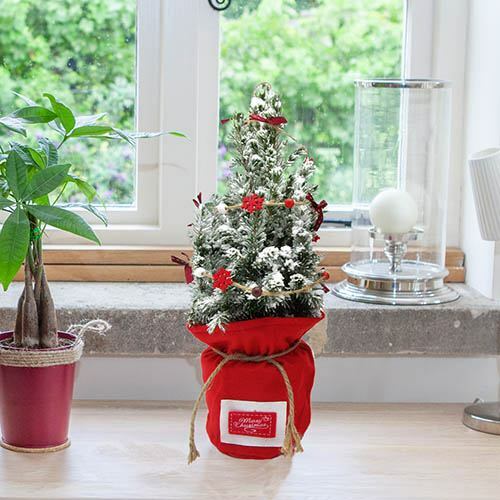 Treat yourself to something special this Christmas do it the eco-friendly way - bring the outside in with our miniature pine tree, NEW for 2018. This sparkling tree is presented in a gorgeous little red felt sack with a 'Merry Christmas' message on it, ready for gift giving or placing exactly where you want it. Your tree is adorned with a festive garland for you as well, so you don't even have to worry about decorating it - we've even added some winter snow for you to make it that bit more Christmassy! Your living indoor tree is delivered with its own liner pot to grow indoors and then when you are ready, it can be moved outside and planted up. Supplied as a young tree, approx. 55cm tall including festive pot, ready decorated. Supplied as a young tree, approx. 50cm tall including red velvet festive pot, ready decorated and covered in artificial snow.